Janine at UpperCase Gallery has declared this week ‘typewriter week’, so I couldn’t resist posting a photo of my Underwood Portable typewriter. I’ve had it for ages and it’s one of my favourite possessions. I own many typewriters and much to my parents’ dismay they are all stockpiled in their basement. I had an uncontrollable habit of buying old typewriters from Goodwill when I was in university. Uppercase put together a rockin’ exhibit of all things Old School. I only wish I had seen it in person. Old School, the book, just arrived at the workroom and I’m getting tons of inspiration flipping through the pages looking at everyone’s interpretations of the old school theme. The roster of participants is very impressive and includes Ray Fenwick, Jen Hsieh, Julia Rothman, Something’s Hiding in Here and Lisa Congdon. Oh yeah, you also get a cute old school pencil when you buy the book, perfect writing notes in class. I hope you have a lovely Thanksgiving weekend. I’ll be out enjoying the fall weather and eating my fair share of turkey and mashed potatoes. I had that same problem too! (buying typewriters while I was in university). And I still do. This book looks so cozy and nostalgic! I will be sure to drop by to take a looksey! Oh my goodness! 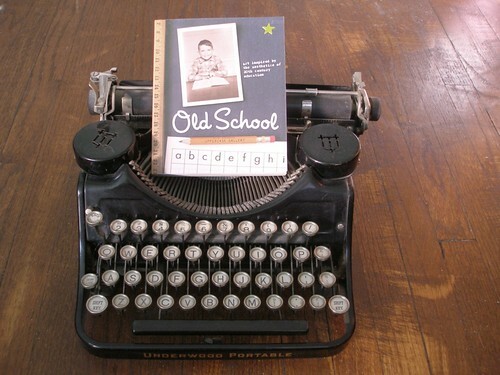 I must track down a typewriter like that – it’s so sweet! Ooh, by the way I got the info on where to get a smocking machine locally. Thank you for visiting over at ML this morning, I was happy to have you there! Your blog is so very lovely and the quilt you are making is gorgeous. I love what you are wishing for today…. celine – how funny about the typewriters! do you still have them? debbie – i actually used the typewriter for a lot of my university projects. this was before i ever used a scanner and used to use a photocopier to enlarge and distort all my artwork. wow, how old does that make me? i’m definitely doing more research into the smocking machine. i gotta smock! melissa – i’m a big fan of your blog, it’s always so full of inspiration and pretty things. thanks for dropping by, it’s so nice to ‘meet’ you!